SECAUCUS, NJ (August 4, 2011) - Panasonic System Networks Company of America today launched its first Cloud-based services solution, Panasonic Cloud Business Phone System for small businesses. This marks the first step into the services industry from a company that has provided state-of-the-art telephony systems for business owners nationwide. Recognized as the number one choice for small business phone systems, Panasonic is now expanding into services to meet changing market needs by pairing its highly regarded business phones with equally reliable Cloud-based voice services. “The Cloud is the new frontier for major technology companies like Panasonic, and we’re excited to harness it for the benefit of our customers,” said Bill Taylor, President, Panasonic System Networks Company of America. “Our small business customers tell us they want a simple, feature-rich, customizable business phone system. Small businesses are the fastest growing business segment in the U.S. today. Collectively they account for more than $92 billion in spending on telecommunications equipment and services. Despite the size of their investment, many smaller businesses are underserved by service providers who have prioritized the needs of larger enterprises. Panasonic, with its history of providing hardware solutions for small businesses, will now use its expertise to provide convenient and cost-effective services to fit small business needs. The Panasonic Cloud Business Phone System is designed specifically to meet the communications needs of owners and operators of the nation’s 5.5 million small businesses. Using Cloud-based voice services provides small businesses with increased benefits such as, intuitive web-based installation and the ability to enable features, or activate additional lines by simply going online, instead of relying on tech support to help. This reliable and easy-to-use phone system does not require complicated IT setup or support and is the first product of its kind to be available online and at convenient retail locations where small business owners frequently shop. Panasonic Cloud Business Phone System is designed in collaboration with BroadSoft, the leading global provider of software that enables the delivery of real time voice and multimedia communications services. An affordable, off-the-shelf communications solution, the Panasonic Cloud Business Phone System includes easy, web-based set-up and account management. Installation is as straightforward as registering the phone online and then plugging it in directly out of the box. The suggested retail price for the basic package, which includes one corded phone and one cordless phone, is $299.99, plus $39.95 per line per month includes popular features, such as remote office, voicemail to email, conferencing and call forwarding, all of which can be tailored to fit a variety of business needs. The Panasonic Cloud Business Phone System model KX-TGP551, offers scalable systems for companies with fewer than 10 employees. Later this year, the company will expand its Cloud service offerings even further. 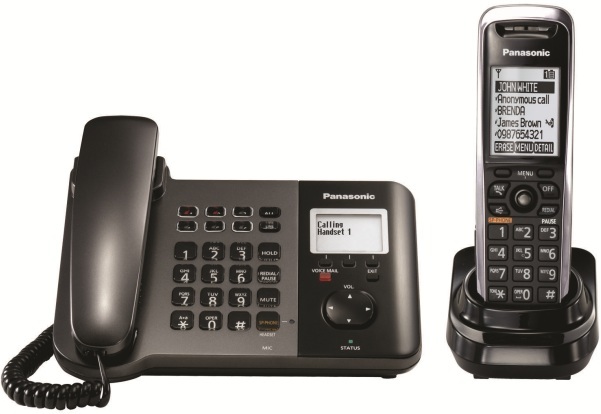 The Panasonic Cloud Business Phone System is currently available at Amazon.com, BestBuy.com, OfficeDepot.com, Staples.com, Frys.com and beginning on August 8, Fry’s Electronics retail stores. For more information, please visit www.panasonic.com/cloud.